I've been carrying a Spyderco Mariner as a primary knife every day since 1982. It has absolutely the most positive lockup, the most readily available carry position and the most direct and intuitive opening procedure that I've experienced. The SpydeyHole is readily found by the index finger and thumb and opening is a matter of quickly articulating hand and wrist. The knife opens in 1/4 second. It can also be opened more slowly by using the thimb to swing the blade. Additionally it can be closed easily with one hand as quickly as it opens. Wearing it in summer in sweaty clothes, while swimming in saltwater and using it to cut salty laden ropes has not resulted in any corrosion at all. Overall it is the best folding knife that I have ever used. 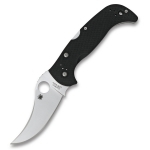 I am dismayed that Spyderco repeatedly discontinues it. 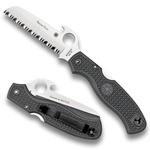 Please, Spyderco, bring back the H1 Mariner. Thank You. Would you mind sharing your technique for closing your knife with one hand? Do you actuate the lock and use your leg to close the blade?